Amid popular participation, the national flag was hoisted over Nabaa al-Sakhar town in Quneitra countryside. 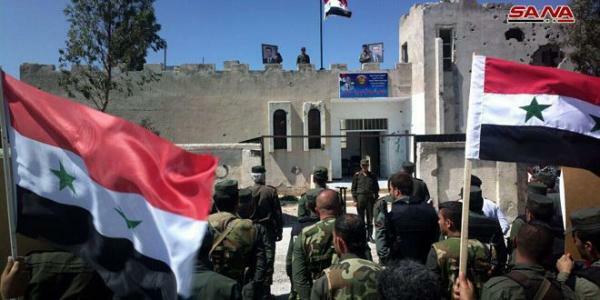 SANA’s reporter in Quneitra said Internal Security Forces entered the town of Nabaa al-Sakhar to the southeast of Quneitra to enhance security and stability and to pave the way for the return of state institutions to it as inhabitants gathered to participate in raising the national flag over the town’s police station. On Saturday, Nabaa al-Sakhar town was liberated along with 20 other towns, villages and farms in the area between Daraa and Quneitra countryside.